UPDATE: Raptor the dog has since been found alive and well, has been reunited with his family, according to the Rifle Police Department. Northbound Colorado Highway 13 in Rifle near West 30th Street in Rifle was closed to traffic late Tuesday morning as Colorado State Patrol and Rifle Police Department crews worked clean-up from an injury crash. Rifle Police Chief Tommy Klein said the crash involved a tractor trailer and a Jeep just north of the 30th Street intersection. He said the driver of the Jeep was sent to St. Mary’s Hospital in Grand Junction with nonlife-threatening injuries. Klein also said there was a boxer dog in the Jeep named Raptor at the time of the crash that police were looking for, and later found. Police are still investigating the accident. Klein said the Jeep needed to be pulled out of the ditch off the highway. Northbound traffic began flowing again by 11:30 a.m. According to Klein, the Jeep slid across the roadway into the ditch approximately 200 feet off the road. Southbound traffic was not impacted. EAGLE COUNTY — The Colorado Department of Transportation, in cooperation with United Companies, begins a roadway resurfacing project on I-70 between Avon and West Vail (mile point 167-16 j73.5). Night construction is scheduled to begin the evening of Sunday, April 14 and continue through October. This is a maintenance resurfacing project that will improve the existing surface of the roadway and will include improved surface friction, which can lead to reduced crashes. Additionally, the project will replace all the existing guardrail in the project limits and bring them up to current standards of crash ratings. The eastbound acceleration lane at Dowd Junction near mile point 171 will be lengthened to provide additional sight distance and merging distance for vehicles using the on-ramp. Minor maintenance repairs will also be conducted on the bridge structures in these project limits in association with the resurfacing work. Drainage improvements will also be completed in Dowd Junction to reduce ponding of water on the roadway during storm events. General working hours will be from 6 p.m.to 6 a.m., Sunday through Thursday. Motorists can expect a single lane closure, both eastbound and westbound, during work hours, with speeds reduced to 40 mph for safety. For more information about the project, call the project information line, 970-661-3883, email the team at I70AvontoVail@yahoo.com, or visit the project website and sign up for updates. Two day drinkers snarled Aspen’s evening traffic Tuesday after causing car accidents, police said Wednesday. The first accident occurred at 5:25 p.m., when Katharine Guimond, 34, of Aspen hit another vehicle on the Castle Creek Bridge, said Aspen police Sgt. Rob Fabrocini. Details of the incident were not available Wednesday, though Guimond was charged with DUI, careless driving and following too closely. The second crash happened at 6:48 p.m., when Jarrett Workman, 30, of Eagle County crashed his Toyota truck into a light pole at Fourth and Main streets, Fabrocini said. Workman smelled of alcohol, slurred his speech and appeared to be under the influence of alcohol or drugs or both, Fabrocini said. Workman failed roadside sobriety tests and was arrested for DUI, possession of a controlled substance, careless driving and driving with no proof of insurance. The substance was an unspecified prescription drug, and Workman admitted he was taking pain killers for a work-related injury, Fabrocini said. A woman passed away following a rollover crash on I-70 Wednesday night, according to representatives with the Colorado State Patrol. Colin Remillard, a spokesman with Colorado State Patrol, said that a woman was killed during a rollover crash on Interstate 70 heading westbound around mile marker 196, near Copper Mountain. Remillard said that CSP currently believes it was a single vehicle crash involving two passengers. The woman was taken to the hospital where she was pronounced deceased. While there’s still plenty of snow for spring skiing enjoyment, there plenty of folks pulling out the river gear in anticipation of a stellar season for river boating. As of the beginning of April, snowpack in the Upper Colorado River basin sits at 130 perfect of normal. Snowpack conditions are well above where they were a year ago when we were wondering if western Colorado rivers would be boatable at all. Accumulating abundant snowpack over the course of the winter is important because it represents a temporary savings account that will be drawn upon for the remainder of the spring, summer and fall. his savings account provides our everyday drinking water, irrigation water for agricultural, in-channel flows that support fish and other wildlife, and the water we enjoy for river recreating. Mother Nature, however, is largely in control of how quickly the water savings account is drawn down. As snow melts in the high country, the runoff makes its way down the rivers and streams of the Western Slope, with peak flow typically occurring during the months of May and June in the Colorado River. The timing of peaking flows and the volume of water that finds its way to rivers and streams is influenced by a number of factors. Conventional wisdom is that warm air temperatures and sunny days have a strong influence on the rate of snowmelt. Newer evidence is showing that human-induced factors are starting to shift historic patterns. Researchers from Colorado State University have found that the timing and volume of runoff in the Colorado River is shifting due to higher temperatures now common in the basin, a result of human caused climate change. The phenomena of dust on snow, or the accumulation of blowing dust that settles on the surface of the snowpack, can also play a role by melting snow earlier. Because of ongoing drought conditions and the notable lack of precipitation in 2018, soil moisture content in the Upper Colorado going in to the winter months ranged from 70 percent below average to less than 30 percent below average. Melting snow will need to replenish soil moisture before runoff occurs. In addition, many of the state’s reservoirs were depleted after the low water year of 2018. The net effect of these influences could mean a reduced peak streamflow and an overall reduced volume of water. Nonetheless, there is plenty of reason to enjoy the bounty of this year’s anticipated runoff. Communities along the middle Colorado River recognize the value of recreational access to the river for the benefits of its residents. From planned improvements at Two River Park in Glenwood Springs to new boat ramps in Rifle, Parachute and De Beque, public opportunities to recreate on the Colorado River are increasing. River paddlers will find challenging and exciting whitewater from Glenwood Canyon to New Castle. Slower waters from Silt to De Beque are more conducive for angling or float-boating. Riverside municipal parks nestled among the cottonwood forests provide families the opportunity for bird watching and picnicking. The Middle Colorado Watershed Council has assembled a community advisory committee to identify opportunities for improved recreational use of middle Colorado River from Glenwood Springs to De Beque. The committee is looking for input from local residents about how they use the river now and ways to improve their experience. All input will be used in the development of a master plan for future planning projects such as river maps and on-the-ground improvements including access points and bankside amenities. Laurie Rink is a project manager for the Middle Colorado Watershed Council, which works to evaluate, protect and enhance the health of the middle Colorado River watershed through the cooperative effort of watershed stakeholders: anyone standing in the watershed. To learn more about the MCWC, visit https://www.midcowatershed.org. You can also find the Council on Facebook at https://www.facebook.com/midcowatershed. A winter storm warning is in effect for Aspen, Snowmass Village and the Elk Mountains starting early Wednesday morning and lasting until Thursday as a strong Pacific storm system moves through the West, the National Weather Service said Tuesday afternoon. The warning calls for snow accumulations above 7,500 feet of “8 to 16 inches with locally higher amounts expected. Winds gusting as high as 50 mph.” The warning, which lasts until 9 a.m. Thursday, covers most of the northern and central Colorado mountains. 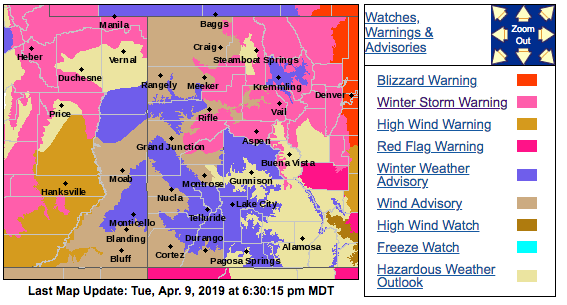 There also are high wind warnings in parts of western Colorado and a blizzard warning for eastern Colorado toward Kansas. Around the Roaring Fork Valley, winds were expected to pick up late Tuesday night, and the rain is expected to turn to snow Wednesday morning as the temperatures drop. The high Wednesday in Aspen is forecast for 38 degrees and Thursday 33 degrees. Wednesday and Thursday nights the lows are expected to drop into the teens.